Sunday morning crept quietly down the Sound of Kerrera, the suggestion of a light breeze gently rocking the boat, the muffled lapping of water against the hull, three short blasts on a ship's horn..... Eh? We'd anchored the previous evening in Little Horseshoe Bay, and had enjoyed a pleasant evening and a good night's sleep. The ship's horn was a bit of a puzzle, as were the men's voices that could now be clearly. Then came the knocking on the hull from a couple of guys in a RIB. Behind them, the bay had been festooned in heavy warps, and the stern of the cable laying ship Galatea seemed to be approaching us at an alarming rate. I was tempted, in my grundies, to jump up and down doing an angry Granpaw Broon impersonation, but couldn't find a walking stick to wave about. We left pretty promptly. We hadn't given any thought about where we were going to, other than to find a bay, drop the pin again, and have breakfast. 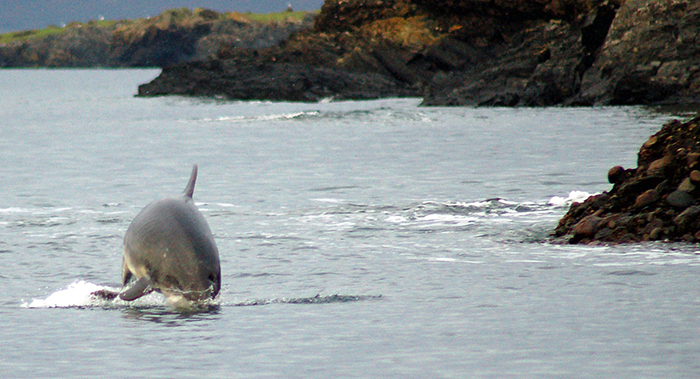 As we left the Sound, probably thinking of having a slow sail to Puilladobhrain, we were waylaid by a pod of dolphins doing their stuff. 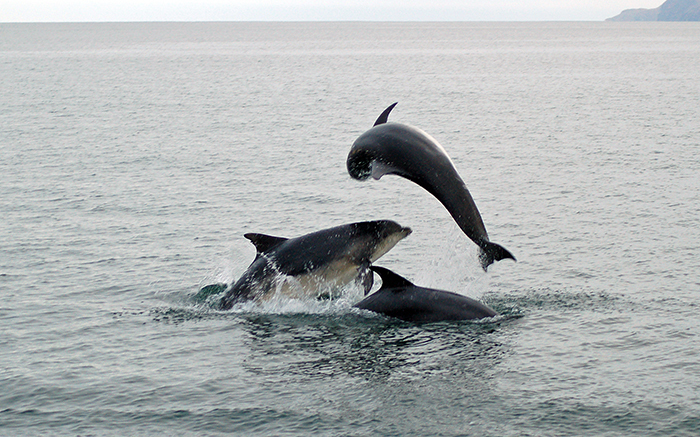 But they are fickle beasts, and like to strut their stuff to appreciative audiences, so it was a dolphin haud-me-back situation when a bright yellow dive boat appeared. Behind the dive boat, Gylen Castle watched gloomily over the jollity. We'd never been there, so decided to look in. It was with some trepidation; there were no sandy coves, just rocky walls. The CCC Sailing Directions said "avoid anchoring in depths over 5m as holding poor". We very carefully crept in to the easterly of the two anchorages, Port a' Chroinn, under the castle. With rocks, on three sides, seemingly less than two boat lengths away, we dropped anchor in about 3m (chart depth), making certain that it was well dug in. The castle loomed above us. I was slightly worried about the CCC warning, but a quick check with the leadline and some grease revealed fine sand on the bottom. As usual, the proximity of the rocks proved to be an illusion, as became apparent when we went ashore. 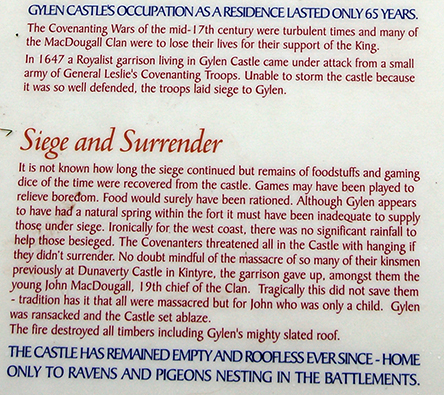 The castle has an interesting history and is worth a visit. Built in 1587, it was a fortified house of the MacDougall clan, but fell victim to the politics of Campbell expansionism and a siege by Leslie's Covenanters. The defenders were coerced into surrender, and then mercilessly slaughtered and the building destroyed. Hamish Haswell-Smith, in his Scottish Islands, wrote that a minister of religion urged Leslie's soldiers to massacre the surrendered MacDougalls. 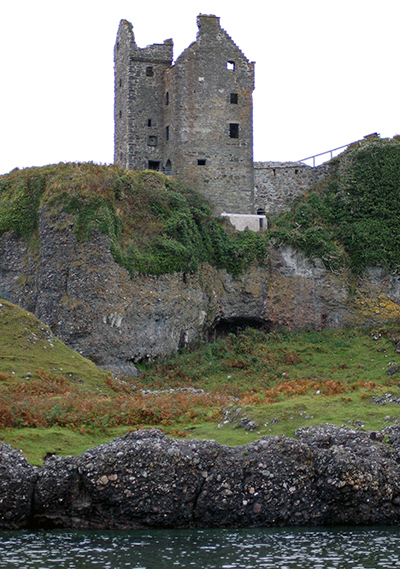 For many years it was believed that the MacDougalls' Brooch of Lorn had been destroyed along with the castle. It seems that this brooch had been lost, allegedly, by Robert the Bruce during an attack in 1306 by the MacDougalls in revenge for the murder of John Comyn. It was publicly admitted to be held in Campbell hands in the 19th century, and returned to the MacDougall chiefs in 1824 by General Duncan Campbell of Lochnell, a symbolic gesture of reconciliation between the previously feuding neighbours. There are two anchorages in Castle Bay, Port a' Chroinn, where we anchored, and, on the west side of the castle, Port a' Chasteil. The former probably gives the best shelter, although Port a' Chasteil does look the better one for landing in a dinghy. 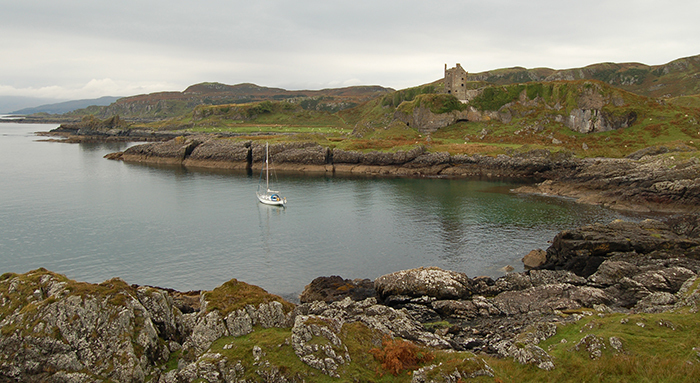 Listed in the "Additional Anchorages" appendix of the CCC's Sailing Directions (2000 edition), Gylen Castle Bay's stunning situation makes interesting anchorage. Sheltered, clockwise, from NW to SE, it's ideal for an afternoon stopover or an overnight stay in reasonable conditions.